I learnt this sambar for idli from my MIL. We call this as “Thakkali gosthu/Tomato gotsu”. Many of you would have heard about Chidambaram Brinjal gosthu. This one is made with onion and tomato, prepared in Thanjavur/Tanjore style.Usually gotsu is served as a side dish for Pongal. But we make this gotsu very often in our kitchen mainly as a side dish for Idli. Its a very easy to make one pot sambar recipe.Ideal recipe for bachelors and working women to make it for breakfast. Its watery texture is the highlight for this sambar. Do try it once. 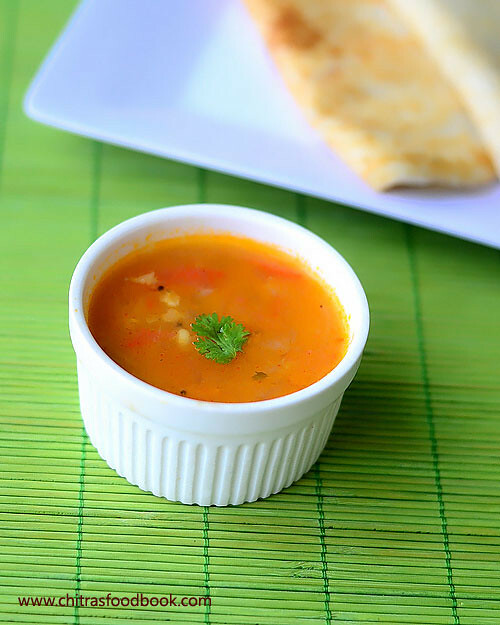 You will love its simplicity.Lets see how to make this easy and quick sambar for idli dosa. Check out my Chidambaram Brinjal gotsu too. Heat a pressure cooker with oil and splutter mustard seeds, urad dal and curry leaves. Add finely chopped onion and slitted green chillies. Saute until transparent. Then add tomato pieces and saute till it becomes mushy. Add moong dal,salt and required water.Pressure cook in low flame for one whistle. Open the cooker and add a tbsp of idli/dosa batter and mix it well.As it is watery onion,tomato,dal,chilly will be separate.So adding this batter gives a thickness & togetherness to this gosthu. If u want,u can replace idly batter with besan flour. But that gives a different taste. Actually in Tanjore, the same gosthu is also made with finely chopped brinjals. Instead of tomato, they add tamarind pulp.But we make this gosthu mostly with tomato and very rarely with brinjal becoz my husband doesn’t like brinjal.So if u like brinjal, u can follow the same method and make brinjal gosthu.It tastes excellent. I have made a post for this HERE.Please check it for variation. i like your kitchen clinic,i have a blog 'ayurveda on my plate' but am not able to update it often........your write ups inspire me to go there......thanks. Never prepared something like dis for Idlies.....looks interesting gal..
pics look awesome! I am going to check viki's blog,I always make like u hav mentioned,i.e; roast and ground,its quite exhausting now,time to try out new!! Tomato kothsu - a very notable recipe for me. Love those authentic recipes u publish always. Thanks for trying my version of Idly sambar. It came out really great and gorgeous for u. U know what? I learnt most of my authentic veg recipes from a family friend who live in a place called Town in Tirunelveli. If I show that aunt ur sambar, she will be overwhelmed with joy:) Have a great day dear. I do brinjal gosthu,tomato gosthu looks yummmm!!!! very delicious recipe looks so yummy and yeh nice color too.nice and very useful info about tomato in kitchen clinic. Lovely curry! Simple and delicious! Will give it a try next time! Looks yum and interesting. I make mixed vegetable and Kathirikkai gothsu. Never tried tomato and dosai mavu addition is new to me. Will try out. Adding a little batter is very new to me.Looks delish! Adding the batter is a nice tip there, Chitra! Tomato gothsu sounds delicious! i also learnt tomato gotsu from my MIL..its prepared slighly different way.. looks perfect..
love gothsu with venn pongal especially..looks yumm..
Another goodness from you..Will be def useful for me..Tx. Tomato Gosthu sounds very delicious! Love the flavors! Adding idli batter is very new to me. Looks yummy and delicious. Thanks Chitra for your wonderful input to my blog.Btw this Clinic idea is excellant.I learn't more about tomatoes. 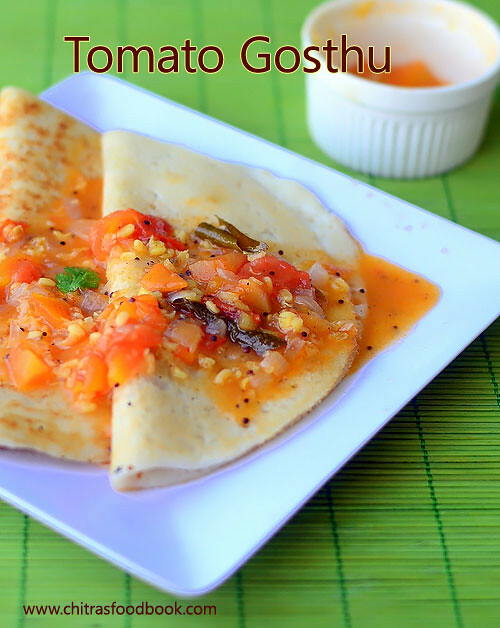 Tomato gosthu looks delicious - must've been a great combination for idli/dosa. i didnt know goshtu was a tanjore speciality!! looks delicious! adding dosa batter is something tat is new to me. am going to try this out sometime. 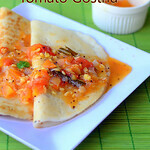 I love anything with tomato and this looks so gud..
Yummy gotshu,never used idli batter for thickening. Gosthu n pongal- one heavenly combo rite? Urs looks so good n yummy. Tomato gosthu looks simple & delicious. I think I'd want to eat this just as is too. hey..i am from tanjore..u too? ?..yummmy kothsu u made.. I belong to Tanjore. Normally I make similar Tomato gosthu, Brinjal gosthu, onion with green chilli gosthu,potato gosthu etc., like you.